Invite personal growth with these tips and worksheets for groups and individuals. This collection of reproducible worksheets is ideal for trainers, managers, teachers, counselors -- just about anyone who works with people -- to provide information for self-understanding and life improvement. 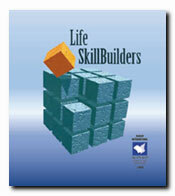 You can use Life SkillBuilders in structured group exercises, for one-on-one counseling, or select several worksheets and build your own activity workbook. Each page is attractively designed and graced with lighthearted, contemporary illustrations. Caring for the Caregiver: What Are Your Needs? Resolving Conflicts: What's Your Style? Where Did You Get Your Values? Ethics on the Job: Where Do You Stand? Building Good Relationships: Do You Know the Score?